Who Pays Your Defense Base Act Attorneys Fees ? How do AIG and CNA get away with telling so many lies and paying for so little ? The Department of Labor’s Jacksonville Florida District Office Director Charles D Lee, formerly of Liberty Mutual, gave his seal of approval to CNA’s lies by refusing to find them in default of an order that he signed himself. It took seven years to get this order. If Mr. Lee does not remember signing this order over two years ago he should. While he signed the order for medical and indemnity probably without reading it, slapped a form cover letter to it, he did not bother to determine the amount of back indemnity and interest owed which allowed CNA to not pay on time and escape the 20% per day penalty. So few penalties apply and so little enforcement of those that do. It took many telephone calls and finally assistance from Michael Niss, the Director, Division of Longshore and Harbor Workers’ Compensation Office of Workers’ Compensation Programs at the time, to encourage him to do his job. He was not going to do it just because an injured contractor had not received his check and was trying to find out why. The failure on the District Director’s part to find CNA in 18 a Default occurred despite having in his possession legitimate proof, letters from Doctors stating that they had never been approved and had in fact been denied payment. Proof of CNA lies to the new Claims Examiner, who comes to us from KBR with a KBR attitude, are ignored by everyone in the DoL from herself, Charles D Lee, Kristina Hall, to Eric Richardson, Miranda Chui, to the DOL IG. CNA never produced a receipt for paying back years of Medical Care that they were responsible for and refused to provide but Charles D Lee determined that they did so based on their attorney saying that they did. CNA paid for a small fraction of the past medical care, finally, 16 months after the order was signed. While this is clearly a 16 month default during which time the claimant has this debt hanging over his head despite having an Order in place, CNA is not held responsible. A receipt has never been produced. Charles D Lee takes them at their word while their lies are in his hands. No dollar value is applied to the damages caused by a refusal to provide medical care for years on end and so there is no penalty or recovery. We talk with contractors everyday who have orders in place for medical that never receive it. The lengthy efforts your attorney must go through to try, not necessarily succeed, to secure the medical care is considered to be “Janitorial” work by CNA that they should not have to pay for. Why not continue with the Deadly Paper Games when it saves you so much money and the very people that are supposed to be looking out for the claimant condone these criminal actions? No dollar value is applied to the temporary injuries which become permanent at the hands of CNA. The hands of CNA, their claims examiners, and their attorneys are so gently stroked by the Departments of Labor’s Jacksonville District Office. 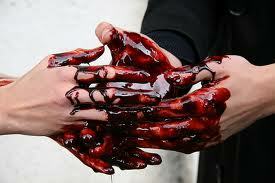 The Blood is on all of their hands. This entry was posted on November 2, 2012 at 12:49 pm	and is filed under AIG and CNA, Civilian Contractors, Contractor Casualties and Missing, Defense Base Act, Defense Base Act Insurance, Defense Base Act Law and Procedure, Department of Labor, Dropping the DBA Ball, Follow the Money, Hope that I die, Injured Contractors, Interviews with Injured War Zone Contractors, Iraq, LHWCA Longshore Harbor Workers Compesnation Act, Liberty Mutual, Misjudgements, OALJ, Political Watch, PTSD and TBI, Racketeering, Veterans, War Hazards Act. Tagged: CNA, CNA Insurance Company, CNA lies, DBA Claimants, Deadly Paper Games, Deny Medical Care, Department of Labor, Department of Labor Jacksonville District Office, DoL, KBR, LHWCA, Liberty Mutual, Longshore Harbor Workers Compensation Act, Medical Care, Request for Default. You can follow any responses to this entry through the RSS 2.0 feed. You can leave a response, or trackback from your own site. As you know there’s blood on the hands of the leaders of both political parties who are protecting theses heinous crimes. I spoke to Republican Congresswoman Marsha Blackburn personally and gave her a handout Tuesday. This included civilian contractors in war zones as one of five types of insurance these deadly crimes are occurring in. You can see what we discussed by going to http://www.christianspleasehelp.blogspot.com Please be advised I do not favor any political party and I will not be voting for any Democrats or Republicans in this election. After viewing some of the website I hope you will call Blackburn’s office and demand action : Please leave a message for Congresswoman Blackburn’s assistant Margaret Tipton at 202-225-2811 and request an immediate investigation and prosecution regarding the evidence Barry Schmittou submitted. Please have all your friends do the same. Many citizens have requested action but they continue to do nothing ! !